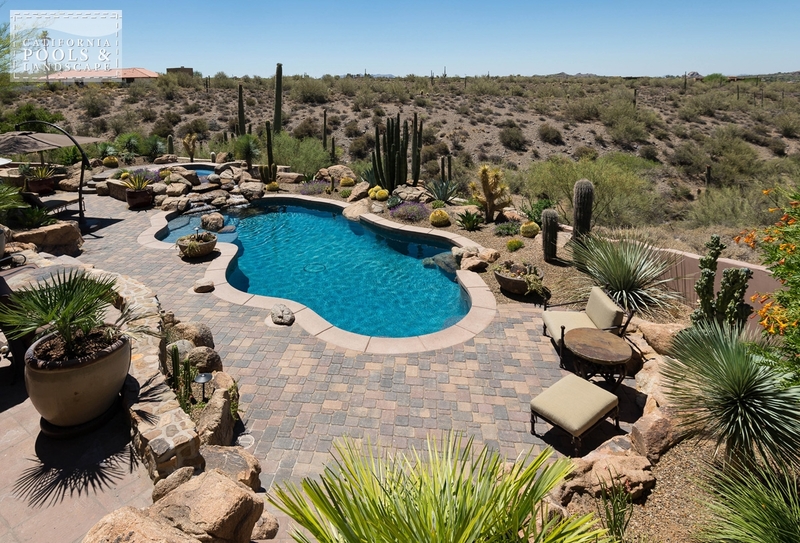 For 27 years, California Pools & Landscape has been the one-stop builder for all of your backyard needs. 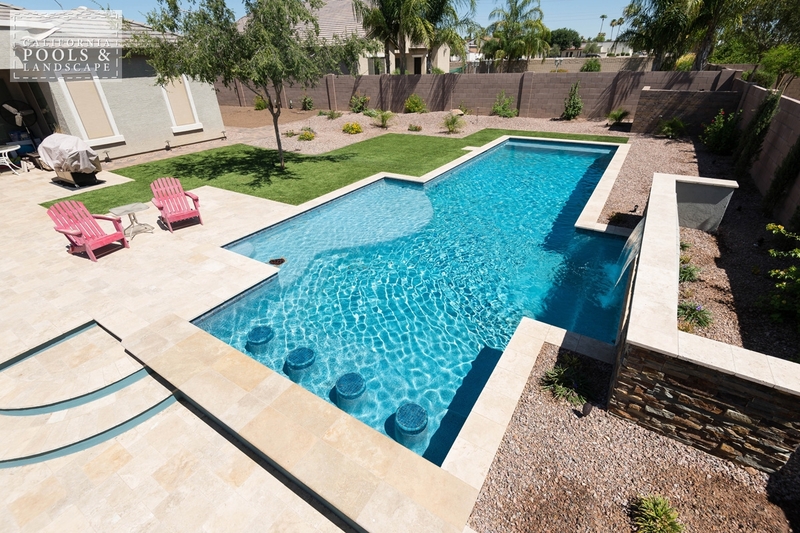 Save yourself the worry of managing the project and dealing with multiple contractors, when we build a pool, we also bring landscaping, hardscaping and everything in between. 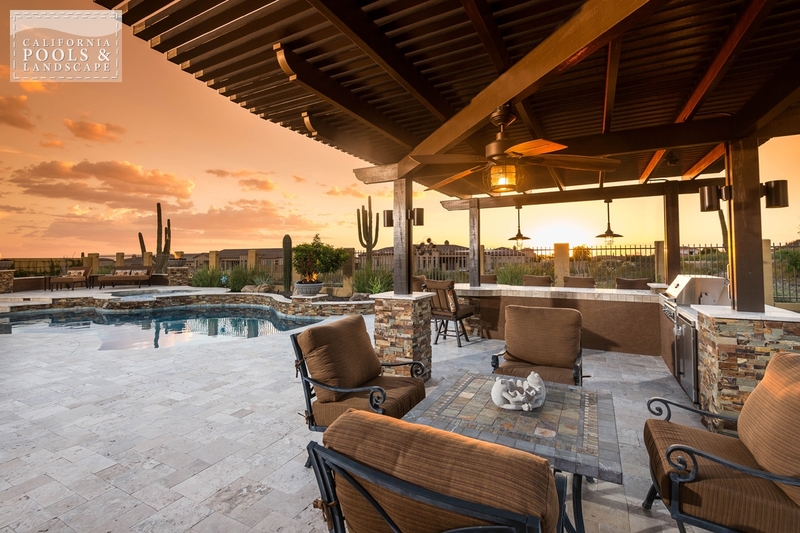 We are the only fully licensed contractor in Arizona for everything from pools to landscape to masonry and structures. 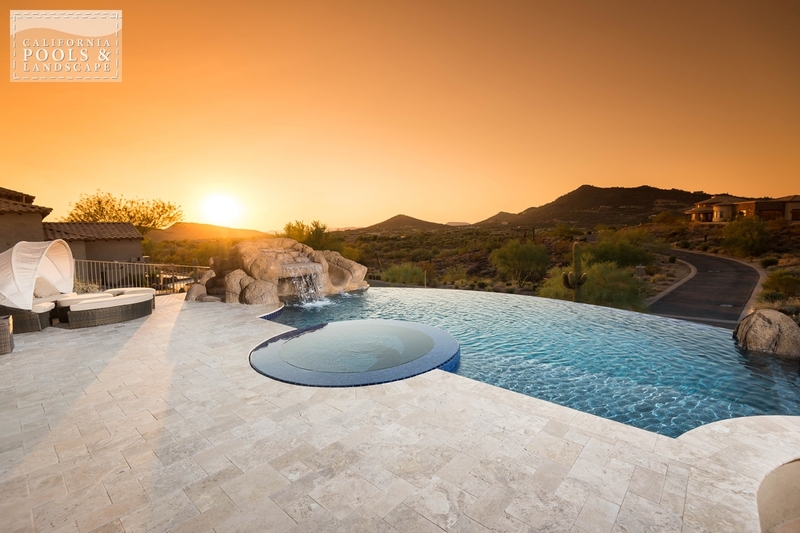 California Pools & Landscape will design and build your new pool and spa as centerpieces of an outdoor living environment for you, your family, and friends to fully enjoy the Arizona desert lifestyle we cherish and others desire. 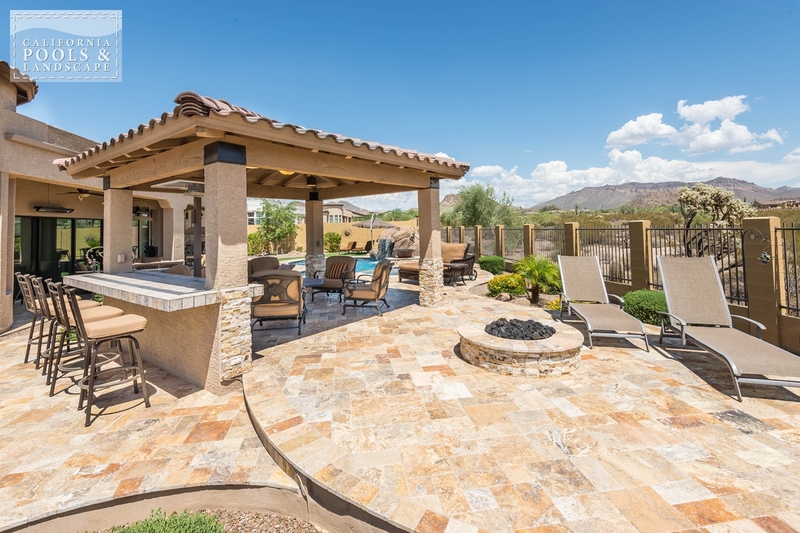 Our in-house landscaping design and installation team can completely realize your vision, and your dream, for a backyard living space everyone will admire. 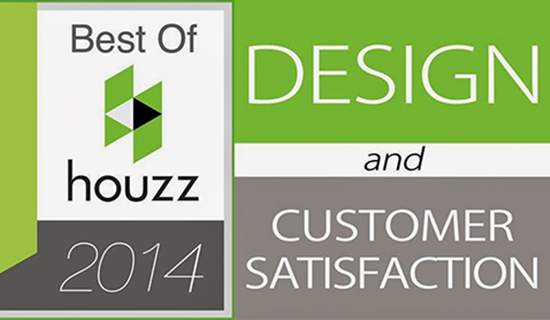 Our locally based team of client-centered designers, project managers and subcontractors will give you the comfort, assurance and follow-up service you deserve — with the hands-on attention of a family business. Just supply your vision, California Pools & Landscape will do the rest. Add exciting fire features, a high-definition television to enjoy sports and shows year round, a gas hearth matching colors and textures of your home fascia and LED lights in the pool, under your countertops or wrapping trees. We’ll set colorful planters on pillars we install and uplight your trees through an automated system requiring almost no maintenance. And, your landscaping, including a lawn area, if you choose, will remain green with an on-the-cusp irrigation system. Add a natural rock waterfall, a koi pond or other water feature as well as heating and electronic controls you can control a mile or continent away with your laptop or cell phone app. Finish your landscape with features you’ve seen at resorts or the environment you experienced during an island vacation or mountain getaway and want to relive every day. Hardscapes are the best way to extend the use of your pool and to really create an inviting gathering space for your friends and family. 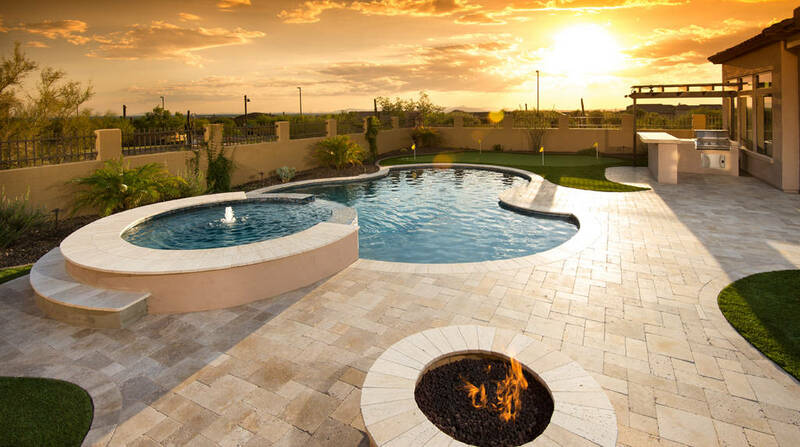 Let California Pools help you design a unique hardscape for your family’s lifestyle that will incorporate and complement the materials you’ve used for your pool, deck, and landscaping. 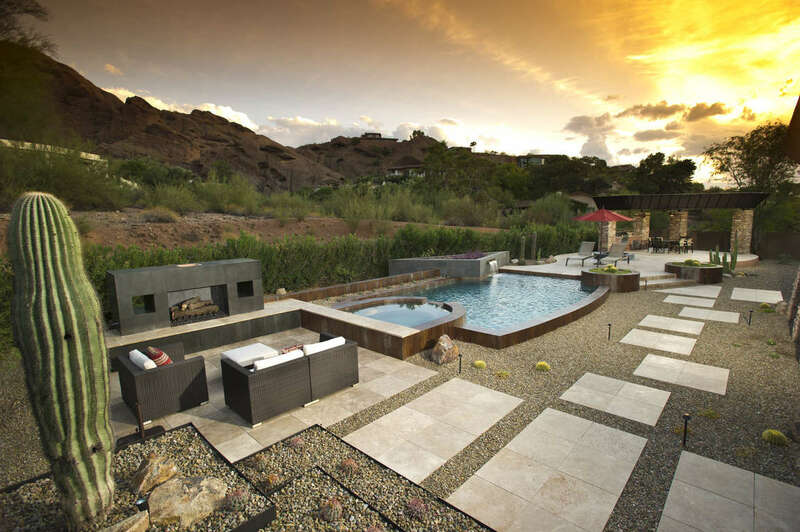 California Pools will help you create an environment that is unforgettable. 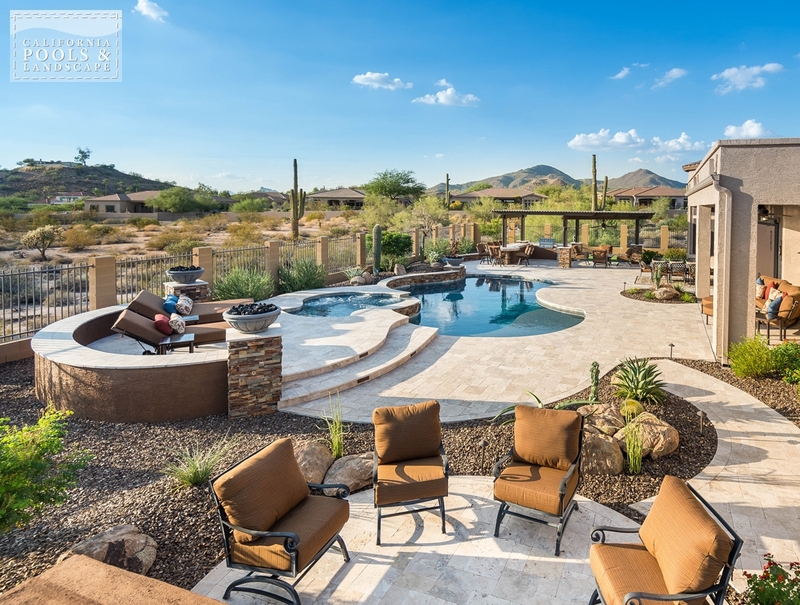 You can incorporate an array of features to blend all the elements of your pool area. Decks, patios, and pavilions can be part of a pool structure and a variety of elevations can draw the eye to create a pleasing aesthetic. Seat walls are just one form of hardscape. The seat wall can be built out of pavers, poured concrete, or masonry brick that can coordinate with the deck of your pool. A seat wall is a great way to add additional entertaining space around your pool. It is both decorative and functional and you can even add in plant boxes or beds for greenery and lushness. Seat walls are a fantastic way to add dimension and depth to your outdoor living space and harmonize your pool with your existing landscape. Another type of hardscape that is a great addition to your pool area is a fireplace. With a fireplace you can have an actual outdoor living room. A fireplace can extend your entertaining season all year round. Even on cool evenings when it is too cold to swim, you can still gather around your fireplace with your family and friends. A fireplace adds romance and a gorgeous focal point to your pool and patio. Many homeowners are building stunning fireplaces of stone that look beautiful next to any kind of pool. A popular type of hardscape near the pool is a fire pit. The fire pit can be wood burning or gas. Through the use of decorative flagstone, pavers, or brick, it can be a beautiful addition to your pool environment. Again, it is a wonderful place to gather on a cool evening next to your sparkling pool. The warm fire and dancing flames invite you and your guests to just sit and relax and enjoy each other’s company. 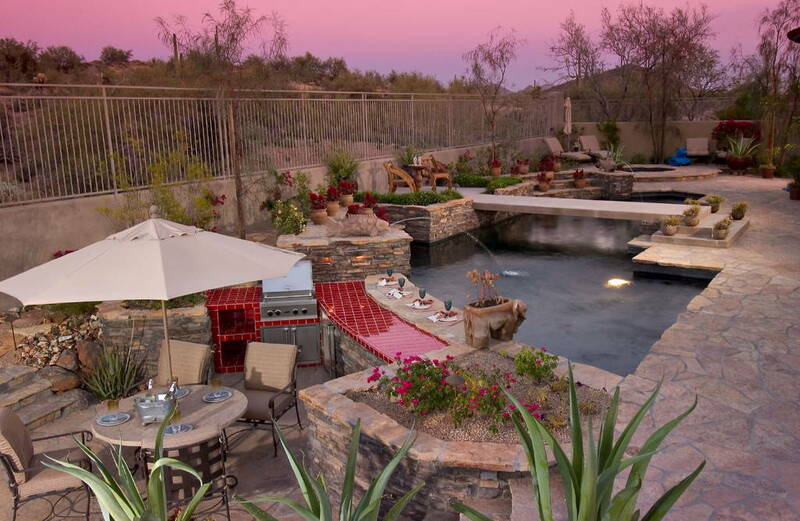 Your BBQ can be incorporated right into your pool and patio area or you can have an entire outdoor kitchen. Again, it allows you and your friends to enjoy your pool even more by allowing you to have meals right next to the pool. No more having to disappear back into the house to prepare meals or fetch drinks or appetizers. With an outdoor kitchen you can keep your guests well supplied and not miss a minute of the fun! Pool structures are a wonderful way to create a true back yard oasis and to add to your total outdoor living experience. They can be used to bring the beauty to your outdoor living space and make a perfect gathering spot for your family and friends. You can include fire places, grills, and even full outdoor kitchens. With overhead fans and misting systems, they can be a cool shaded retreat on a hot summer day. With professional design and installation, pool structures can be a perfect blend of form and function. 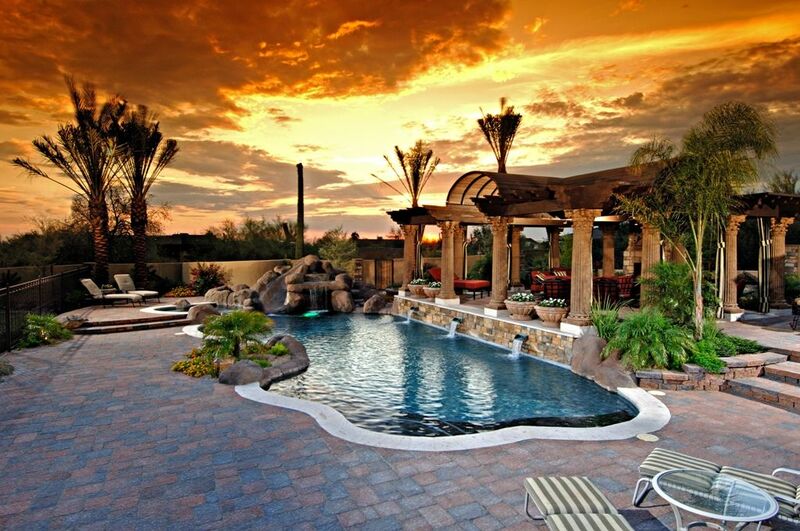 Let the professionals at California Pools and Landscape help you make your backyard dreams a reality.